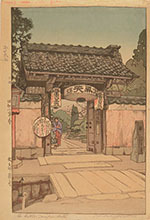 Hiroshi Yoshida is considered one of the leading figures of the renewal of Japanese printmaking after the end of the Meiji period. Yoshida's artistic talent was discovered early and at the age of 18 he entered a private art school in Tokyo. Hiroshi started as a painter and soon won many art exhibition prizes. But it was not before 1920 that he began creating wood block prints. Hiroshi Yoshida traveled a lot. He came to the United States, Europe, Africa, India, China, Korea and throughout Japan. Another passion was mountaineering. Hiroshi Yoshida prints reflect both his love for traveling and for mountains. Most prints show landscape scenes from his travels and mountain subjects from Japan and the European Alps.